Are you getting enough vitamin D? Try these natural sources. It keeps your bones strong, wards off sickness, and may even fight cancer and heart disease. Is there anything that vitamin D, the superhero of nutrients, can’t do? Often referred to as “the sunshine vitamin,” vitamin D is created by the human body when directly exposed to ultraviolet light. Yet many people are not creating enough, especially during the winter, when days are short and sunlight is weak. “It’s almost across the board in the wintertime,” Dr. Elizabeth Yori said of low vitamin D levels in her patients. A naturopath practicing in Belfast, Maine, Yori said she usually prescribes vitamin D supplements seasonally to her patients to correct the imbalance. “Because we’re above the 44th parallel, you could be pretty much naked outside all day long in the sunshine [during the winter], and if you didn’t die of frostbite, you still wouldn’t make enough vitamin D in a day,” Yori said. In addition the supplements, certain foods and drinks contain vitamin D. You just have to know what to look for. Vitamin D helps the body absorb calcium, a building block of bones, according to the National Institutes of Health. Furthermore, the vitamin blocks the release of a hormone that absorbs bone tissue, which makes bones thin and brittle. Vitamin D bolsters the immune system, which fights off invading bacteria and viruses. Some studies suggest that vitamin D might help prevent certain cancers, diabetes, heart disease, high blood pressure and multiple sclerosis. However, the results of many of these studies are either preliminary or under debate, according to Cleveland Clinic. Vitamin D is measured in International Units (IU), which measures the activity of some vitamins and other biological substances, such as enzymes and hormones. Using that measurement, the recommended daily amount of vitamin D is 400 IU for infants, 600 IU for ages 1 to 70 years, and 800 IU for ages 71 and older, according to the Food and Nutrition Board. If you are concerned that you might be low in vitamin D, the most accurate way to measure how much is present in your body is a 25-hydroxy vitamin D blood test, which costs an average of $50, can be ordered by your health care provider and is covered by some health insurance companies. Regular sun exposure is the most natural way to get vitamin D; however, some people live in areas if the world where sunlight is scarce, or certain lifestyle or careers do not allow for much time outdoors. An increasing number of people are avoiding direct exposure to the sun because it its link to skin cancer and early aging. There is no set formula for how much time you need to spend in the sun for your body to create enough vitamin D because many factors determine how much vitamin D you make, including the strength of the sun, the amount of skin exposed, the shade of your skin, your weight, and the presence of smog and clouds, according to an article in the Journal of Pharmacology and Pharmacotherapeutics. In the absence of sun, Amy Rothenberg, ND former trustee for the board of the American Association of Naturopathic Physicians, often suggests that her patients try consuming more vitamin D-rich foods and oils. Fatty fish, such as salmon, tuna and mackerel, are among the best sources of vitamin D. However, not all fish contain the same amount. Boston University Medical Center conducted a study to evaluate vitamin D content in fish and found that wild caught salmon contained 988 IU of vitamin D per 3.5 oz, which is the recommended serving size. In contrast, farmed salmon had approximately 25 percent of the vitamin D content. In addition, the study found that farmed trout contained 388 IU of vitamin D per serving, and tuna had about 400 IU of vitamin D per serving. Vitamin D is also present in mushrooms, according to the Mushroom Council, a U.S. organization of fresh mushroom producers. 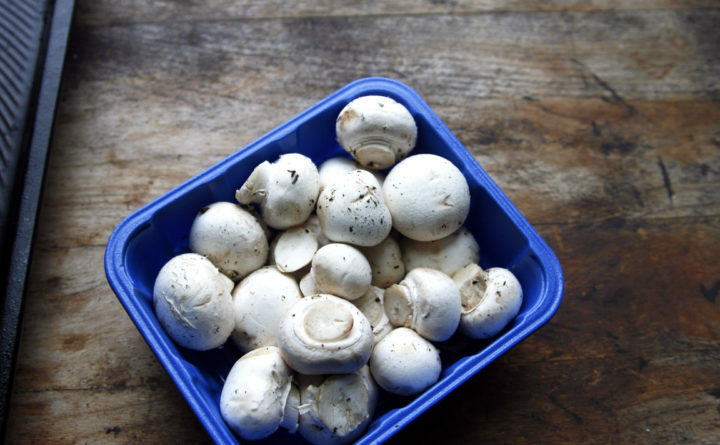 Growers can increase vitamin D levels in mushrooms by exposing the fungi to ultraviolet light. However, like fish, not all mushrooms contain the same amount of vitamin D.
Some of the most vitamin D-rich mushrooms, according to the US Department of Agriculture, are baby bellas, portobello mushrooms, maitake mushrooms and white mushrooms. In the United States, milk started being fortified with concentrated vitamin D in the early 1930s in response to widespread vitamin D deficiency in the population, according to the National Academy of Sciences. Today, almost all of the milk supply in the U.S. if fortified with vitamin D. Vitamin D is added to many dairy products such as cheese and yogurt, breakfast cereals, margarine, soy beverages, and orange juice. Because the number of foods and drinks that contain vitamin D are so limited, Yori often prescribes vitamin D supplements to her patients. While vitamin D is important, it can be dangerous if you regularly consume more than your body needs. According to National Institutes of Health, too much vitamin D can cause confusion, disorientation, problem with heart rhythm and damage to kidneys. The upper limit for vitamin D is 1,000 to 1,500 IU/day for infants, 2,500 to 3,000 IU/day for children 1-8 years, and 4,000 IU/day for children 9 years and older. It’s difficult to consume too much vitamin D in food or drink. Therefore, vitamin D toxicity almost always occurs from an overuse of supplements, according to the National Institutes of Health. So if you do plan to take a daily vitamin D supplement, consult a doctor to find the right dosage for you.